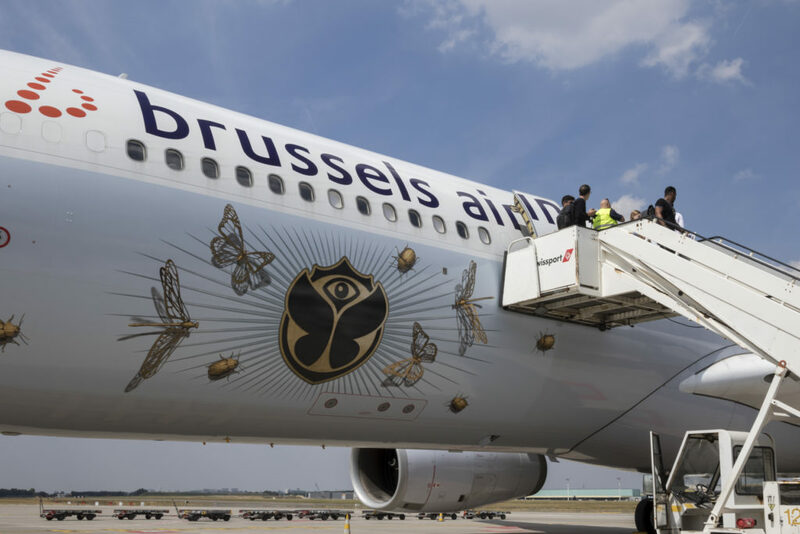 For the seventh year in a row, Brussels Airlines organized party flights from all over the world to bring more than eleven thousand festival goers to Tomorrowland in Boom, Belgium. 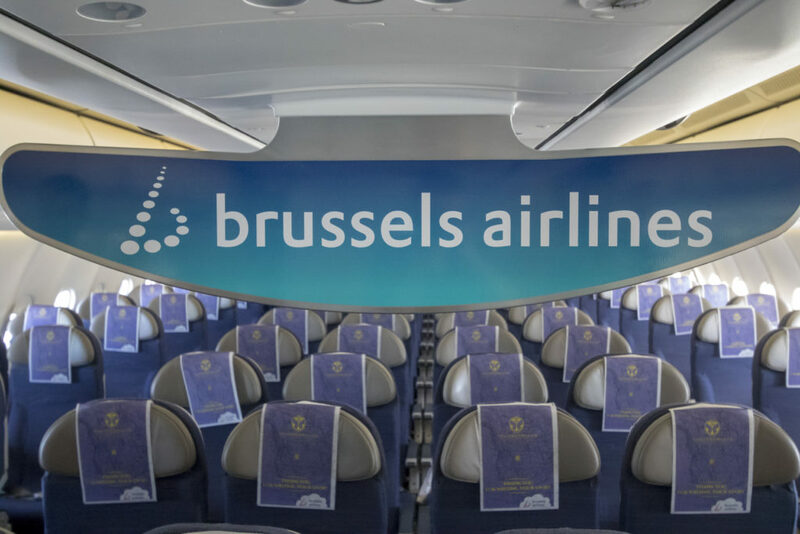 I was kindly invited by Brussels Airlines to join one of these party flights and fly on board flight SN1808 from Frankfurt to Brussels, operated with Airbus A330-343 OO-SFX. 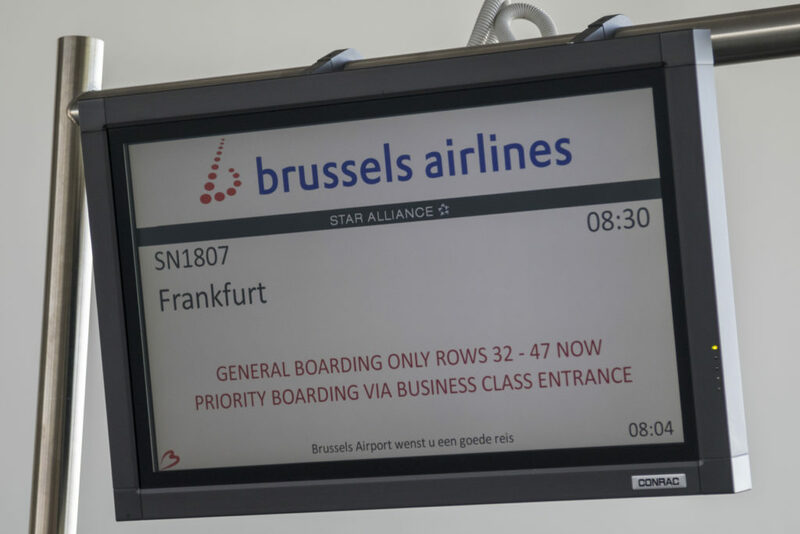 Before operating the flight from Frankfurt to Brussels, the aircraft first had to be positioned from Brussels to Frankfurt. 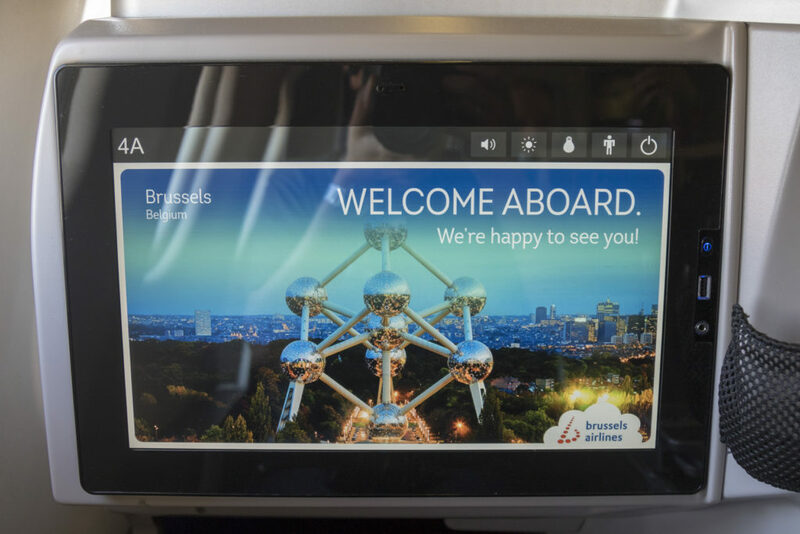 About 30 passengers, mostly members of the press, joined the crew onboard Brussels Airlines flight SN1807 from Brussels to Frankfurt. 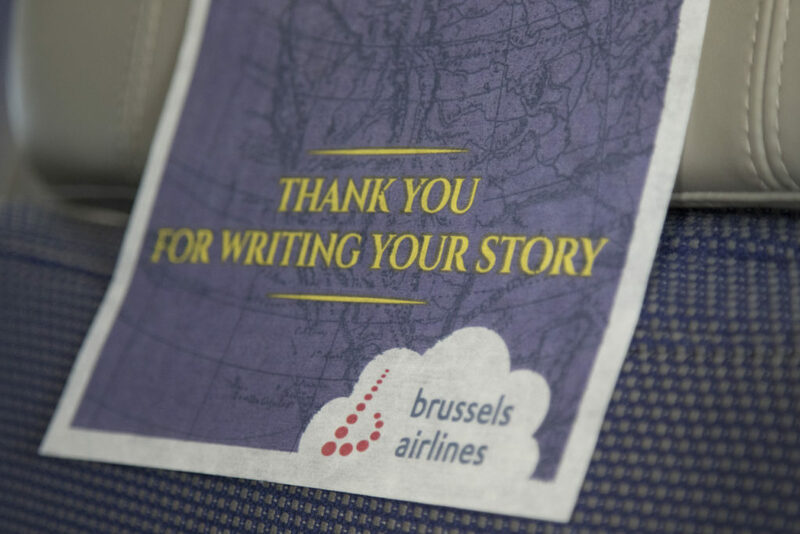 We were kindly asked to meet at the Brussels Airlines ticketing desk at 07:15 AM and were greeted by Ms Wencke Lemmes (VP Corporate Communications) and Mr Tanguy Cartuyvels (VP Marketing) of Brussels Airlines. After we received our press ID card, our boarding pass and a printed infographic, we moved to the fast lane and went through security without a hassle. 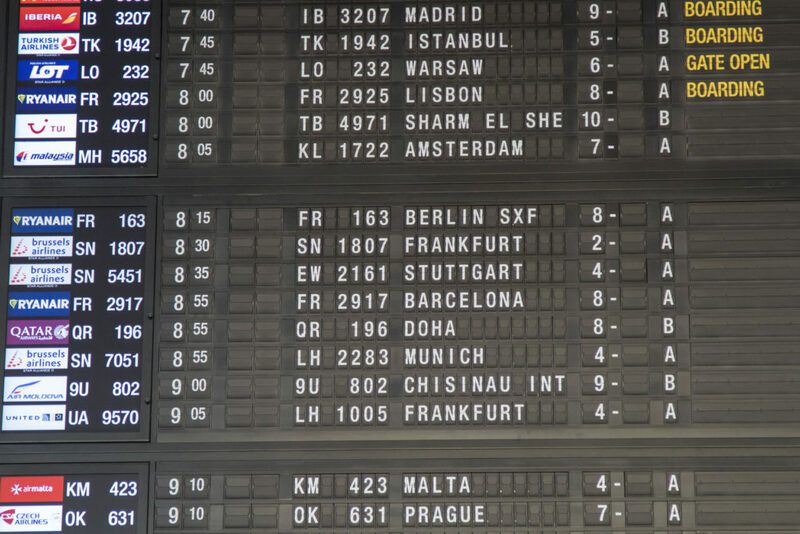 Brussels Airport’s famous departure board showing our flight SN1807 to Frankfurt. Flight information at our gate A57. Our aircraft for today: Airbus A330 OO-SFX. 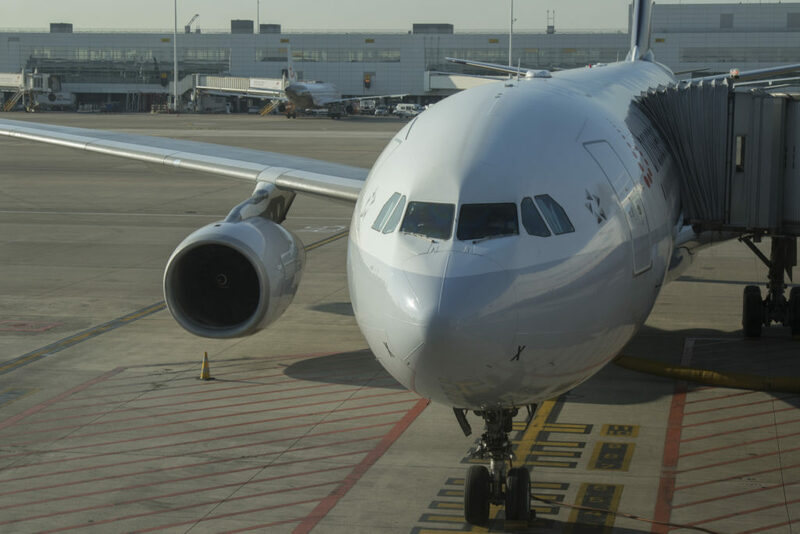 Our Airbus A330 was already awaiting us at gate A57. The aircraft had not flown the day before, most probably to prepare the aircraft for this party flight and to make sure it was not delayed on a return flight. You do not want to keep hundreds of festival goers waiting in Frankfurt for a delayed aircraft. 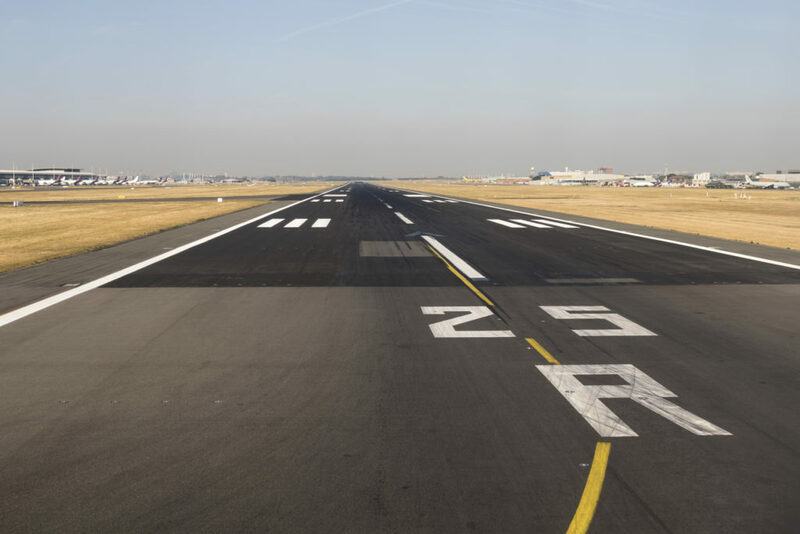 After a quick boarding – most guests were seated in the business class section of the aircraft – we pushed back from gate A57 at 08:28 AM and taxied to the active runway. Few moments later we took off from RWY 25R and headed in an easterly direction, bound for Frankfurt. 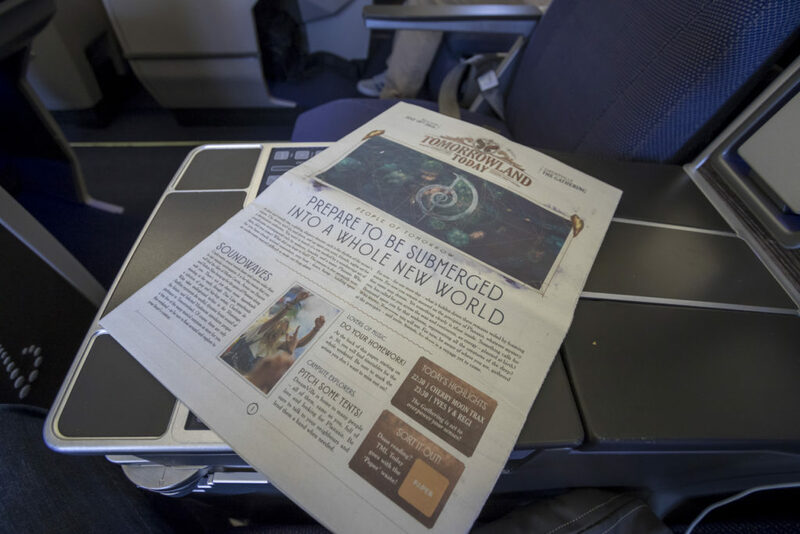 Economy class section featuring special Tomorrowland headrest covers. 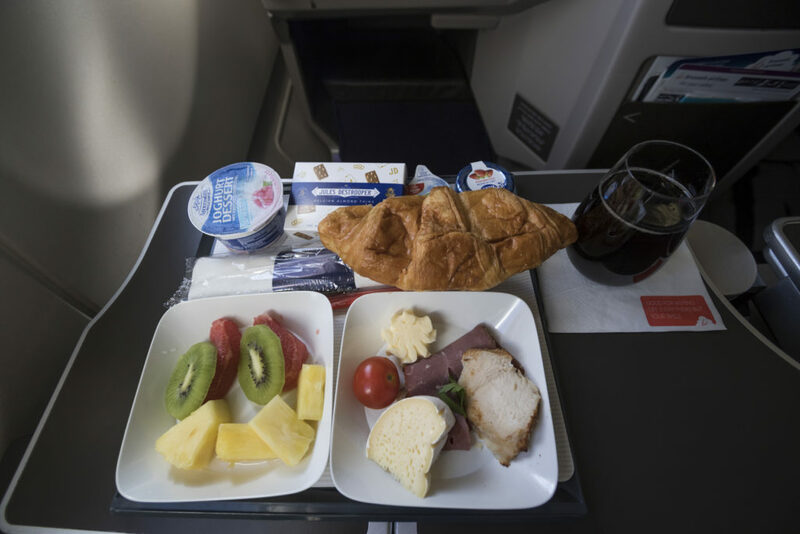 During the short and flight to Frankfurt the passengers were treated to a healthy breakfast – a nice gesture and very much appreciated – and the DJ’s were doing some final checks of their gear and the aircraft systems in cooperation with some engineers and maintenance technicians of the airline. Lining up with RWY 25R. Brussels Airport few moments after takeoff. 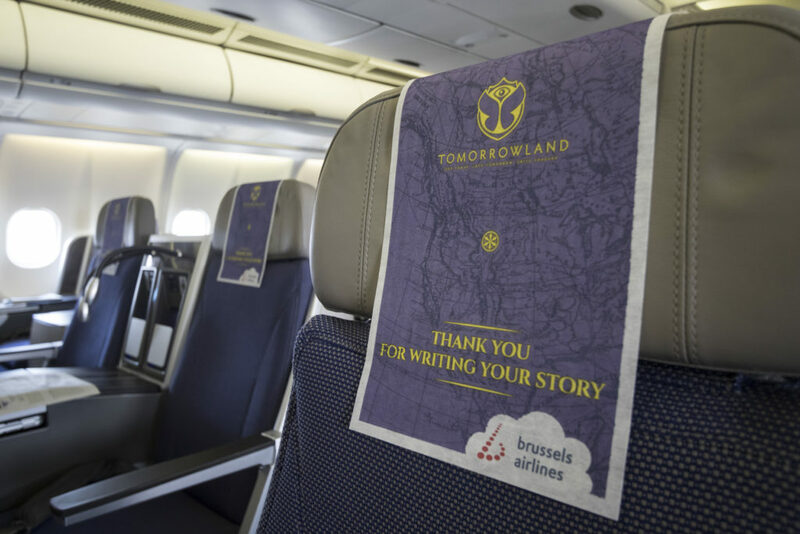 Special headrest covers for Tomorrowland. One of the Tomorrowland hosts for the party flight. 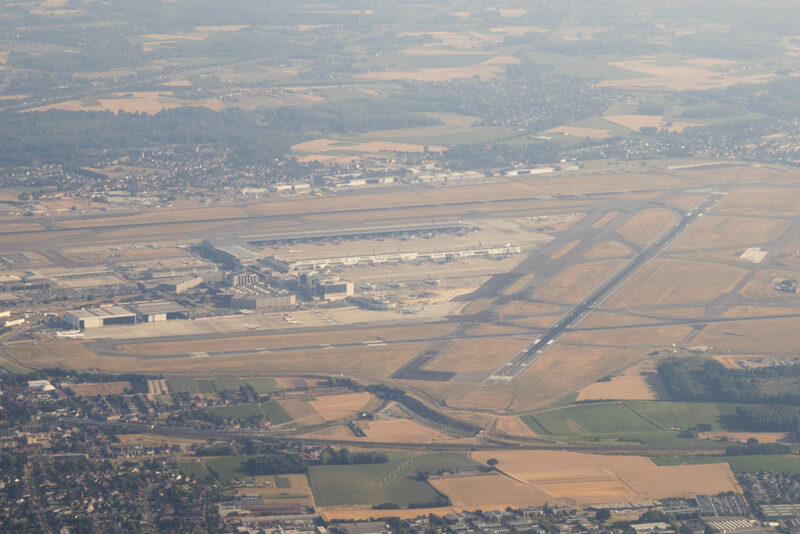 Few moments later we started our descent into Frankfurt Airport and after enjoying a scenic approach we landed on RWY 07L at 09:11 AM. Nice breakfast for members of the press. 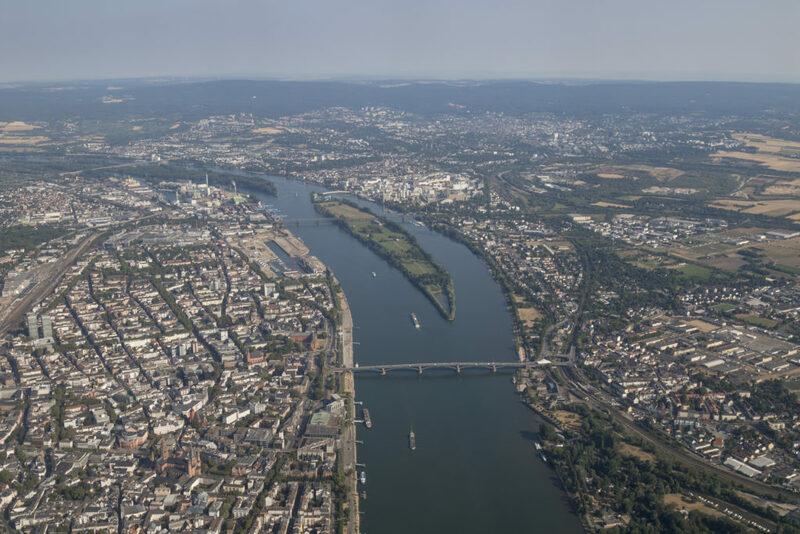 Scenic view of Mainz while approaching Frankfurt Airport. View of our own aircraft as we taxi to our designated gate. As soon as our aircraft came to a complete stop at gate B19, the cabin crew made a funny announcement “we wish you a pleasant stay…at the gate” and we left the aircraft and made our way to the gate. There was already a DJ playing a live set, bringing the atmosphere of Tomorrowland to the gate. 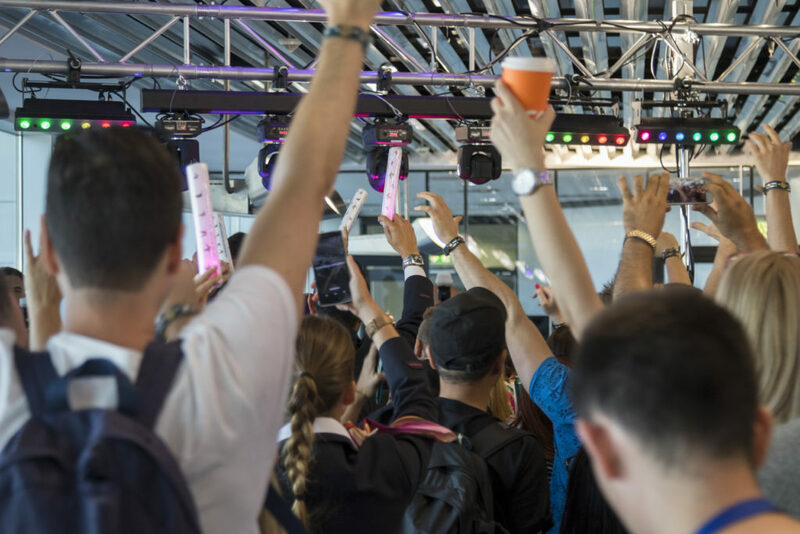 This was just one of the 24 airport gate parties that will take place for this year’s edition of Tomorrowland. 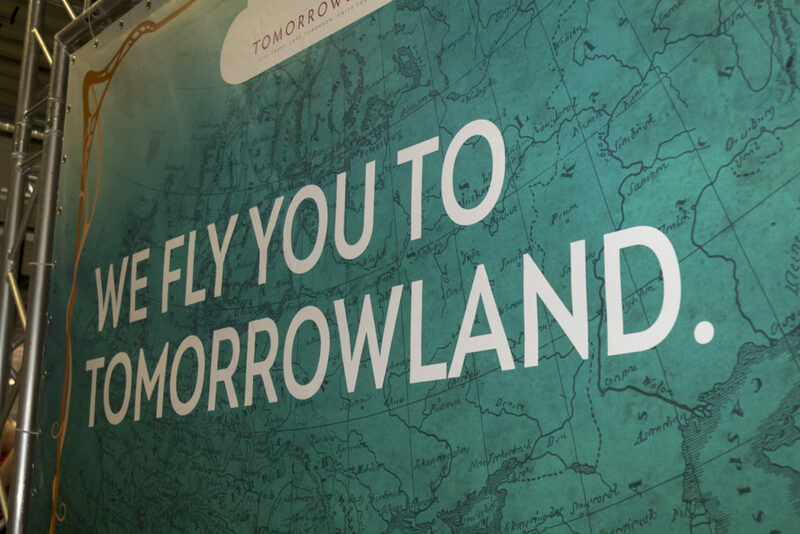 We fly you to Tomorrowland. Cabin crew enjoying the gate party. Gradually, more and more festival goers began to arrive at the departure gate and people started to get into the festival mood. 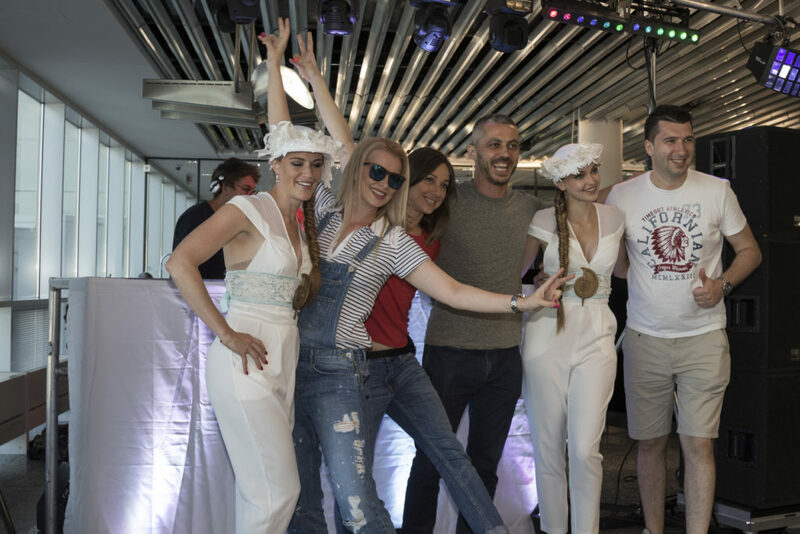 Some of them had already been travelling for quite some hours (if not days), so they unpacked their country’s flag and posed for a photo shoot in front of the DJ. 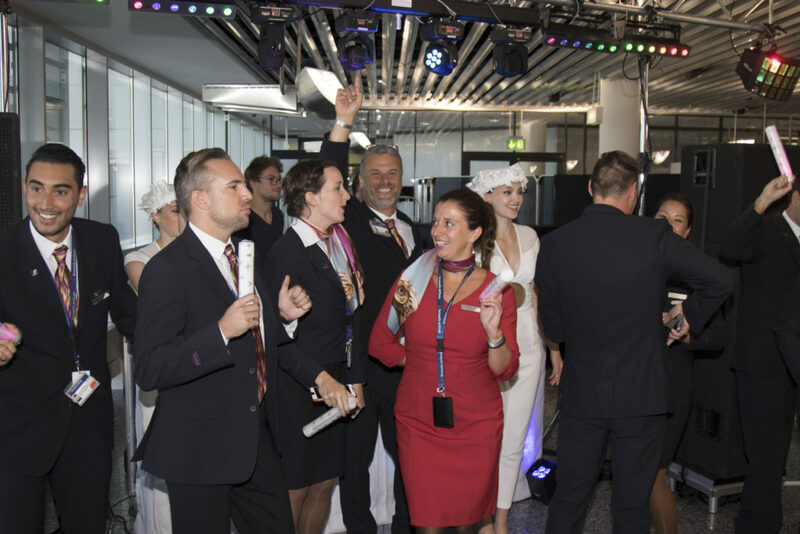 Even the Brussels Airlines cabin crew decided to join the party for a few moments which was really nice to see. 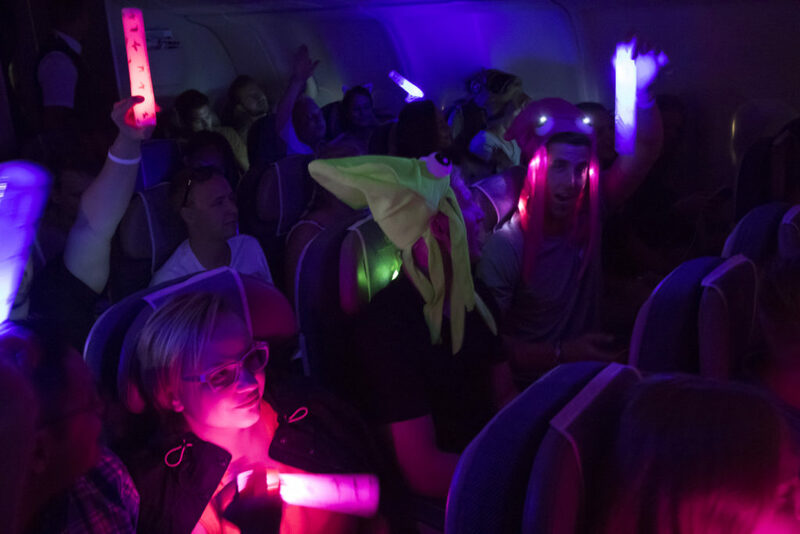 People Of Tomorrow ready to fly to Tomorrowland. 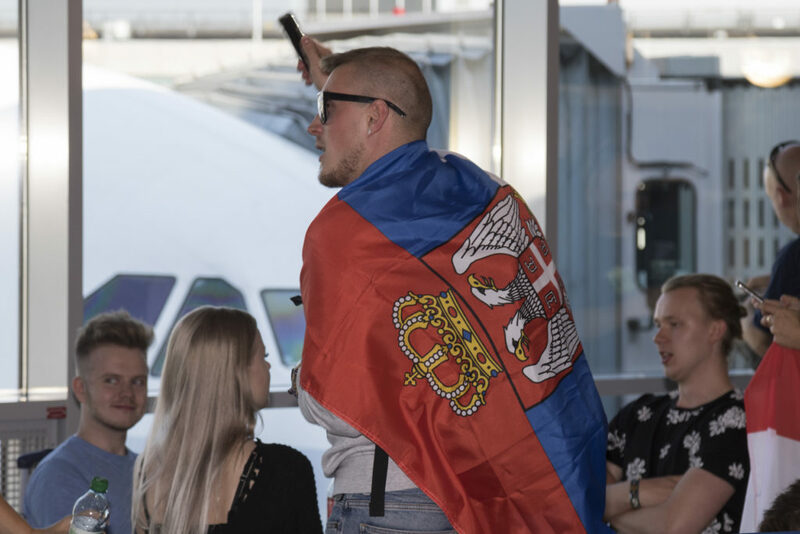 Before we began boarding for the return flight to Brussels, the members of the press and some festival goers were invited for a short airside photoshoot in front of the aircraft. 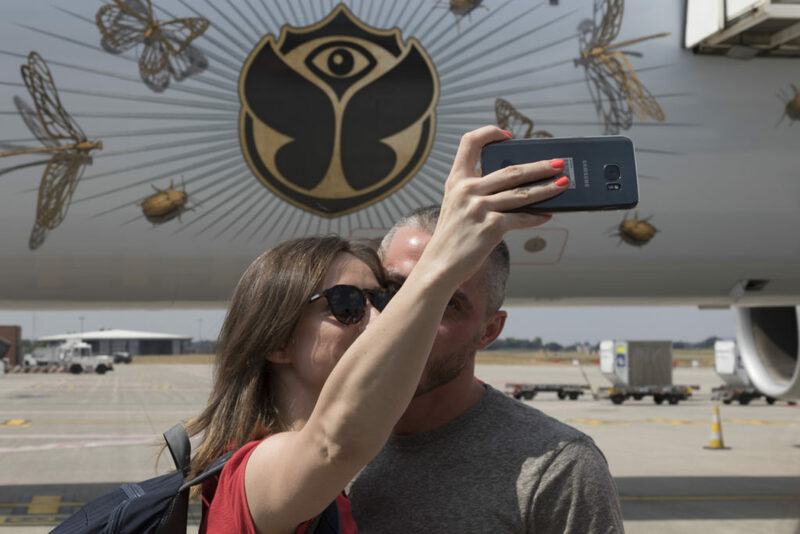 Always nice to have a photo souvenir in front of the airplane that will fly you to Tomorrowland, especially if the aircraft wears a cool temporary livery of the dance festival. Around 10:30 AM the members of the press were kindly invited to pick up their boarding pass for the return flight and few moments later boarding began. After we had boarded, the festival goers started to board as well. As this boarding took quite some time, I made a quick visit to the cockpit for a brief chat with one of the pilots as well as some other Brussels Airlines employees. A quick visit to the flight deck of our Airbus A330 to have a chat with one of the pilots of this party flight. After boarding was completed, our doors were closed and we pushed back from gate B19 at 11:25 AM. Our engines were started and we started a long taxi towards runway 18, just one of the active runways for departure (for instance, some eastbound traffic was taking off from RWY 07C). Headrest covers in the business class section of our aircraft. At 11:45 both thrust levers of our Airbus A330 were advanced and we commenced our takeoff roll on RWY 18. 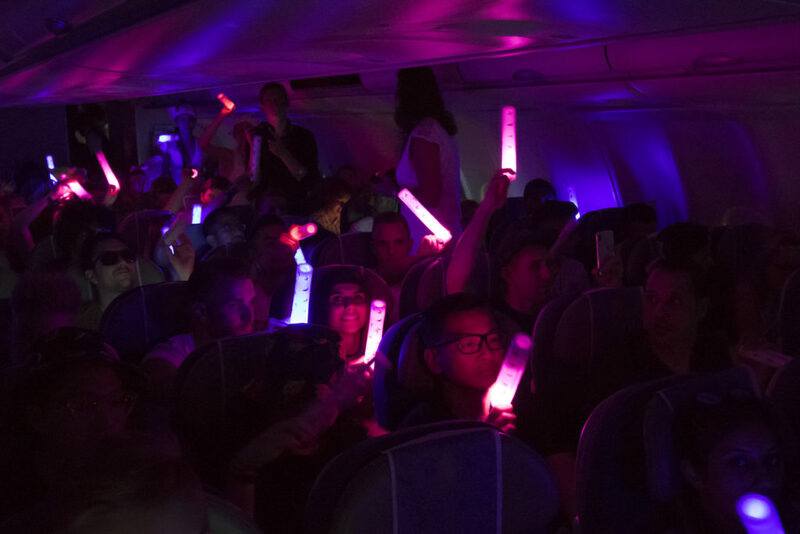 This was welcomed by a big round of applause by the festival goers in the economy class section of the aircraft. Few moments later we rotated and were on our way to Brussels Airport (or should we say ‘Tomorrowland Airport’). 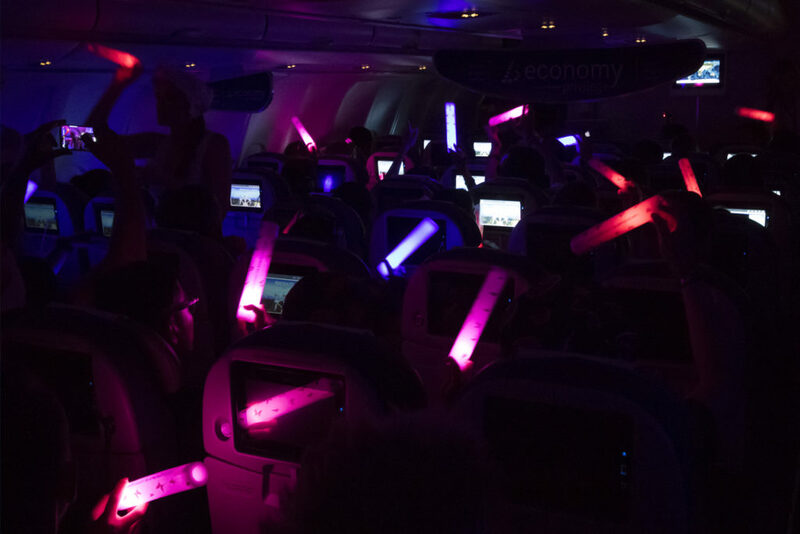 Another round of applause could be heard in the aircraft cabin. 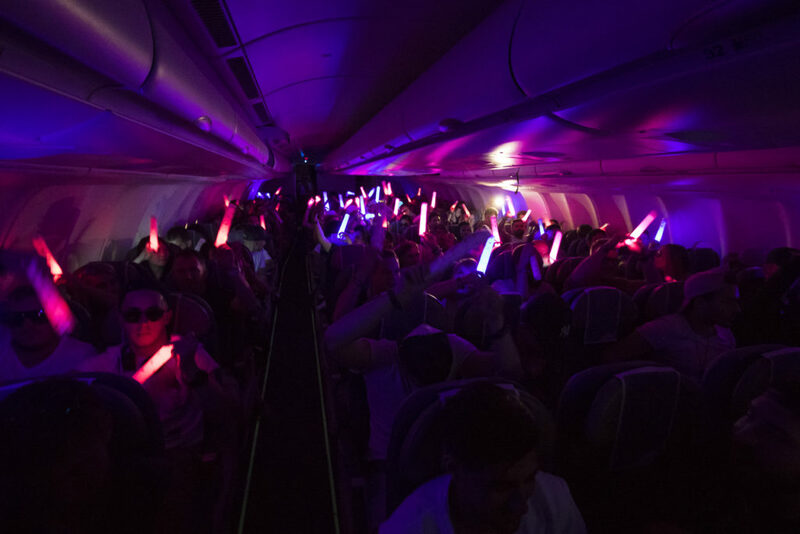 As soon as we reached a safe cruising altitude, cabin crew members made a short announcement and all passengers were kindly requested to close all window shades and festival goers were instructed to remain seated at all times during the live DJ set. 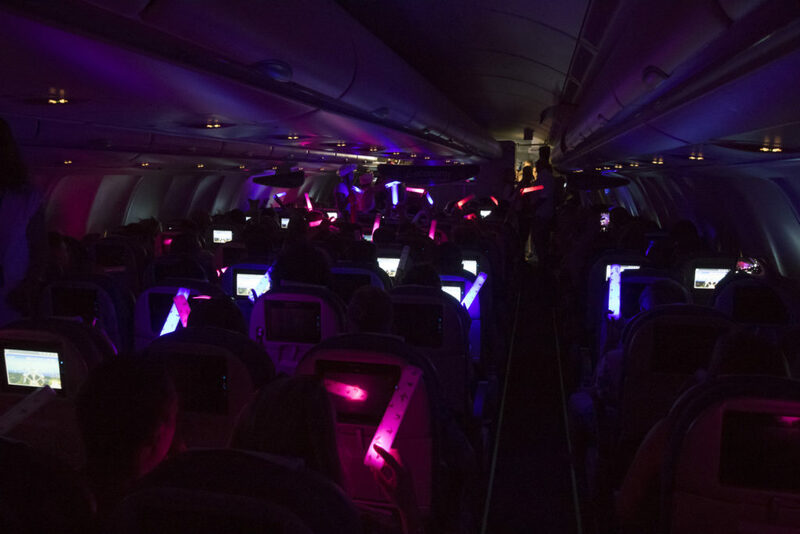 Few moments later the first beats could be heard in the aircraft cabin and the aircraft was transformed into its own flying dance festival while cruising at FL220. Tomorrowland party in full swing. Less than twenty minutes later we had already started our descent into Brussels and the DJ’s had to stop their live set. 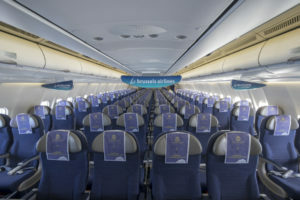 The window shades were reopened for safety reasons and members of the press were asked to go back to their seat and make sure everything is OK for the approach and landing. After a final check by the cabin crew members our flaps were extended and we aligned with the runway. Finally, the landing gear was extended and at 12:30 we made a soft landing on RWY 25R. 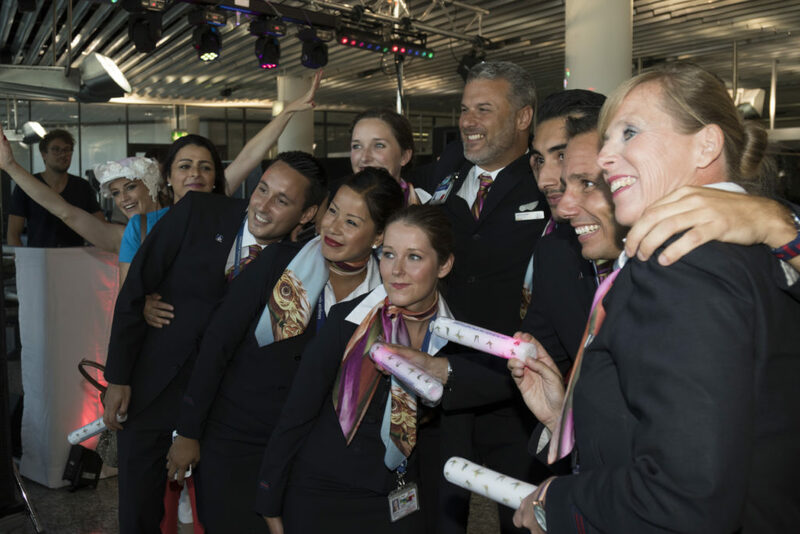 As our Airbus A330 exited the active landing runway, everybody was welcomed to ‘Tomorrowland Airport’ by the cabin crew members. 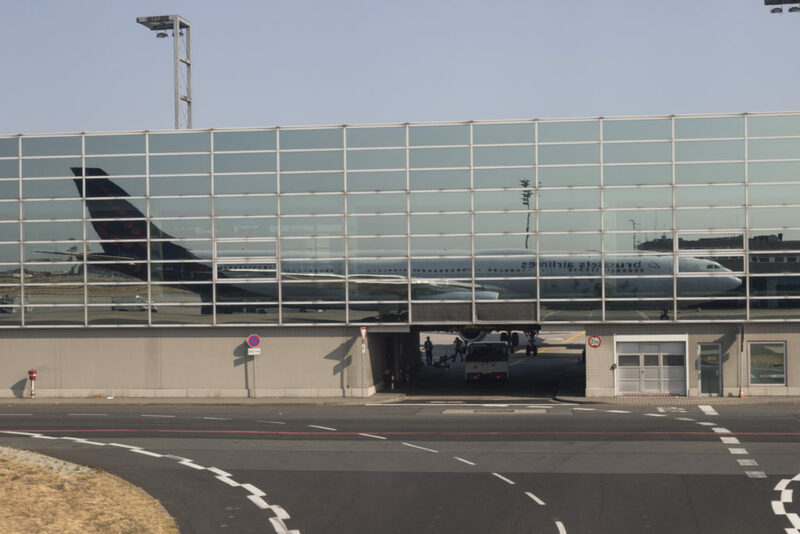 After a short taxi to a remote parking position, the aircraft came to a final stop, the parking brakes were set and both engines were shut down. 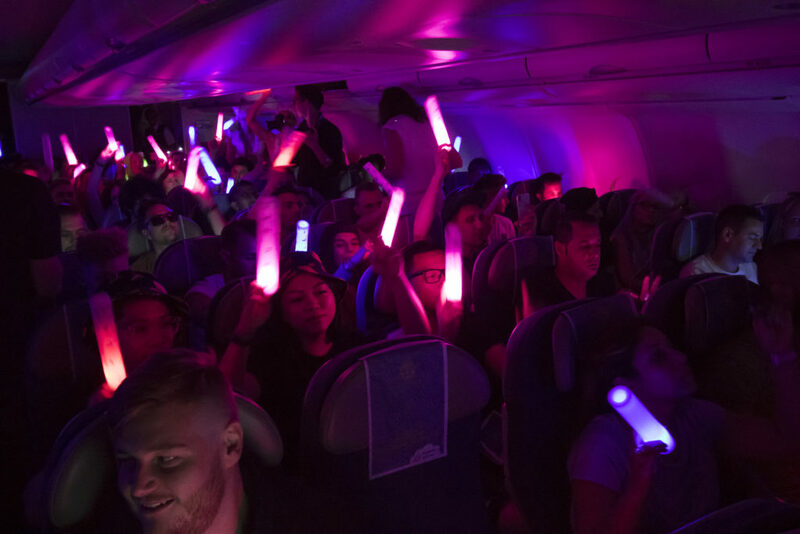 The end of a unique Tomorrowland party flight. This couple is ready for Tomorrowland. 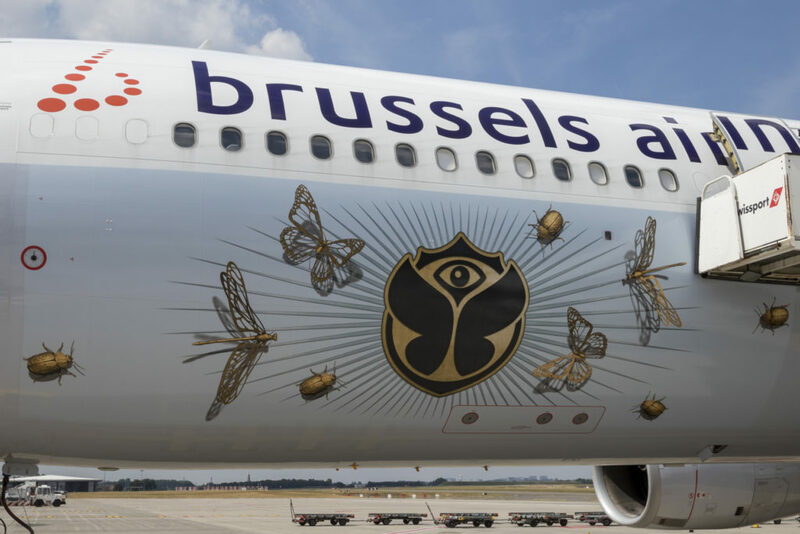 Many thanks to Brussels Airlines and Tomorrowland for kindly inviting me on board this Tomorrowland party flight. 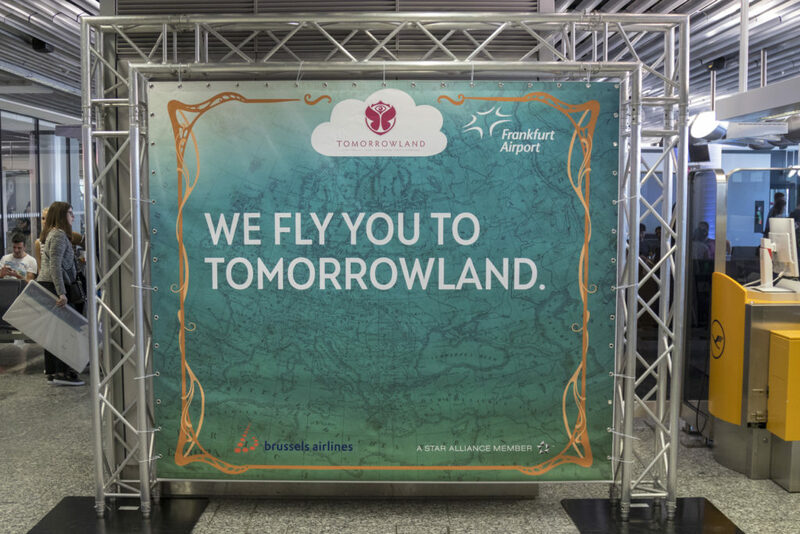 This entry was posted in Brussels Airlines, Trip Report and tagged Brussels Airlines, Party Flight, SN1807, SN1808, TML Party Flight, Tomorrowland, Tomorrowland Party Flight.